In this day and age, many of us own plenty of convergent devices, or consumer electronics that do far more than what they were originally intended to. This is not strange or otherworldly, as it can be classified as progress instead. Take your smartphone for instance – it is more or less a portable computer in your hand, where it not only functions as your basic communications device, it also doubles up as your Internet reference, dictionary, calculator, currency converter, and of course, camera. While the $49.99 Bluetooth Speaker LED Bulb does not have that many functions embedded, it does what it is supposed to do pretty well. 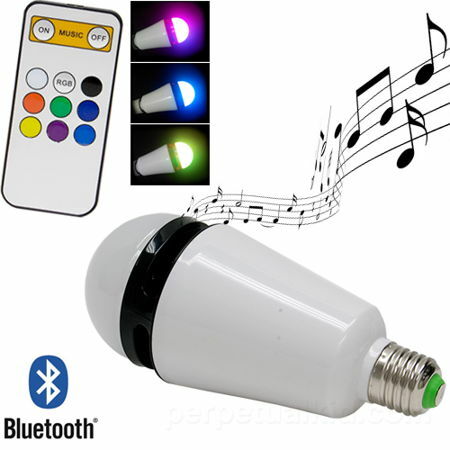 The Bluetooth Speaker LED Bulb is so easy to use, that all you need to do would be to screw on this multi-colored light bulb into a normal socket. From there, you can connect a compatible smartphone or tablet to it via Bluetooth connectivity, as it plays back your favorite tunes via its powerful built-in speaker. In addition, there is also a pocket sized IR remote that can be used to change the bulb’s color to one of several fun colors. Alternatively, you can leave it on its own, with the bulb set to RGB in order for it to seamlessly fade between between white and a rainbow of colors.